Hany smiling in his wheel chair . Hany Hassan Mohamed Nasr is a disabled asylum seeker who came to Sweden seven months ago. Hany came to Sweden via Paris by plane, from France to Holland and then to Sweden. An Egyptian having stayed in Kuwait for one year, he is currently living in one of the asylum seekers camps around Stockholm. Hany wants to get better, having been born with polio, a condition that has left him with weak muscles and hands affected. Hany’s situation is not the best as he comes under the Dublin Regulation where Sweden plans to deport him back to France. His asylum claim has been rejected but now has been appealed. Hany faces many challenges with mobility due to his disability. He needed a wheelchair or a scooter and applied through Migrationsverket which referred him to Landstinget which referred him to the municipality which referred him back to Migrationsverket. As he is a Dublin case a wheelchair was not granted. Out of his food money given by the migration board Hany paid for a wheelchair that cost him two thousand Kronor, which is a huge amount for an asylum seeker. The migration board did not pay him back the money. 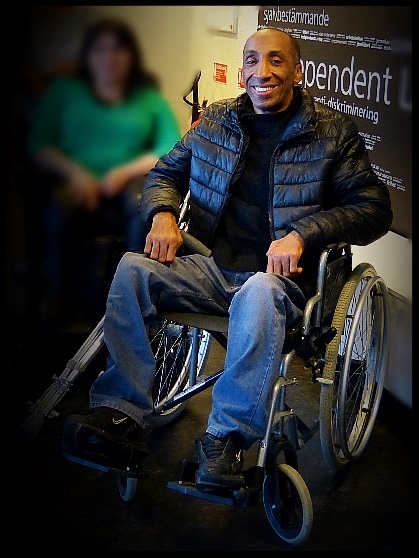 The ILI project – Disable Refugees Welcome is looking for means for him to recover this money for the cost of his wheelchair. Hany wants nothing more than to work but he cannot because he does not have a work permit. Hany’s health is weakening which has increased the risk of falling so needs treatment for his health but again cannot access health care due to migration policies regarding asylum seekers. During his free time he likes to draw and listen to the radio. Having attended courses at the library for both Swedish and drawing Hany is painting and has accessed a social network. He has a great sense of humor, he is very creative and his positiveness is contagious. Hany is full of creative ideas on how to better the world. DRW has encouraged Hany to make more paintings in order to arrange an exhibition in his name, giving the possibility to raise the money spent on the wheelchair.